Sara remembers the tragedy that recently hit their town and the impact it had on her fiancee. Sara’s morning started in the best possible way, the four of them sitting in the kitchen, she and her mother had coffee while Justine and Jerod ate some leftover spaghetti from last night. Jerod was making all of them laugh, even her mother, who was notoriously hard to please. But that credit might not have been all Jerod’s but her new wife’s. Justine had one of those infectious laughs one just cannot resist joining in and Dina Caliente certainly didn’t seem to be immune to the charms of the younger woman. 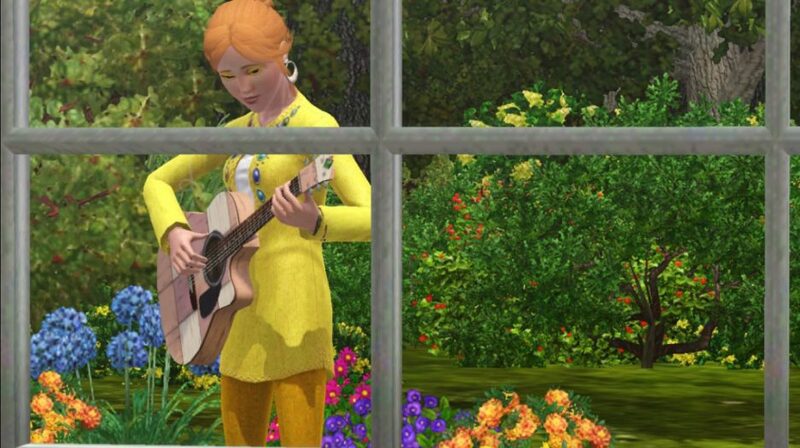 They seemed so in love, Sara’s mother and her second wife, even after the charming fairy-tale wedding right here in the garden, and the romantic honeymoon in Champs Les Sims, just the other night Sara could see them in the garden, picking flowers for each other. She hoped that one day she could be like that, just give in and be happy but she doubted it could ever really happen, both she and Jerod had been through so much, happiness seemed like just a very distant dream, forever out of reach. But it was fine Sara guessed, life was more than just being happy and in love all the time, for now seeing the smiles of her loved ones would do. All in all Sara came to work happy that day, she hummed a tune under her breath as she pushed her way to her office, not even stopping for coffee, she figured her mother’s brew was strong enough to hold her until lunch. It was supposed to be a regular morning, police work in Sunset Valley was rarely more than ordinary and dull. But before Sara was halfway through her morning routine of reading and sending out long and tedious reports there was a very loud knock on her office door followed by an emergence of a tall, gray haired and bespectacled man. “Mr. Hoves!” She exclaimed in surprise as she watched him enter her office. “Good morning lieutenant.” He replied with a grave note in his voice closing the door behind him. It wasn’t the first time Sara had the older man in her office, he was the head of the forensics department and had worked for the SVPD his whole life, it was however the first time he was here since his recent retirement. Sunset Valley was a small town and like everyone else Sara heard how he had developed a drinking problem once he was out of the force but today his look was not one of a drunk. His eyes were sharp and determined and if Sara was to be honest it scared her a little. “There had been a murder.” He said as he took a seat opposite Sara. “There was a distress call, a body was found in the dumpster behind the theater. I was fixing some stuff at home when I heard it on the police radio…” He said dismissively. “How come I didn’t hear about it yet?” Sara asked. “I caught the officer that was on his way to tell you on the stairs, I said I will do it.” He spoke with the efficiency of a man that used to be in charge and Sara couldn’t be the one to tell him he no longer was. It was an uncomfortable situation, she knew the man ever since she was nothing more than the receptionist down in the basement even though she now technically outranked him. And besides it seemed that someone was dead, murdered no less, she couldn’t waste any time. “Tell me what happened.” She said putting everything aside. She was lieutenant Sara Caliente and this was her job. He rose from the chair leaving Sara to feel like a little child in her own office. “But sir… You are retired…” She finally managed to mutter. He looked at her with a frown. “There was a murder lieutenant. There hadn’t been a murder in this town since my uncle had been gunned down in that warehouse. We didn’t solve that one and I will be damned if I let that happen again.” With those words he left Sara’s office leaving her to quickly collect her bearings and go back to work. Her beautiful morning already seemed a lifetime away. She was last to arrive on the already cramped parking lot behind the grocery store. A mass of people had already gathered around the adjoining building but Sara noticed with a little bit of pride her officers had done a good job keeping the noisy citizens outside the yellow tape that marked the crime scene. She walked over making her way through the bystanders. The dumpster was moved and by happy circumstance shielded the body of the poor man from the invading looks. She didn’t go there immediately but to her officers Kerry and Mayor who were waiting for her to submit their initial report. “Morning lieutenant.” Mika’il spoke first. He was a thin young man with dark hair, dark eyes and a small goatee Sara didn’t like one bit. He was also engaged to her cousin, or so her mother had told her the other day. “Morning.” Vanessa muttered after him. She seemed more visibly shaken by the scene in front of them than her partner. She was the same age as he was, also dark-haired, with softer brown eyes and a complexion that usually wasn’t as pale as it was now. “Morning.” Sara said not feeling well herself, but doing her best to not let it show in front of the younger officers. “What do we have here?” She asked turning to the dead body on the street. “Elderly male, dead from what appears to be a stab wound, or multiple stab wounds… I didn’t really want to touch the body before the M.E. comes….” Mika’il started. “Well we didn’t really check… I mean, I assumed it was a robbery, why else would someone stab an old man?” Mikha’il answered. “You mustn’t make assumptions.” Sara echoed the words of her old mentor. “Check his wallet.” She felt her phone vibrate and pulled it out of her pocket. Frédéric Jr. Hoves the caller ID read. She sighed loudly. The old man just wouldn’t let her run this case alone. She turned back to her officers. “Wait for the M.E here. Once he is done you run the scene Vanessa, collect all you find, take pictures and take it all to the lab. Mika’il, check the ID and come to me.” They both nodded and she left them to their job moving away to take the call. The old man had nothing new to say. He gave instructions on things she already knew and ended the call saying he would call Vanessa next, just to be sure she does her job just right. In a way Sara was glad he was back, he was the top forensics specialist in the country and yet it was her case, she wanted to be left alone to run it. She sighed again planning to go back to the scene when she saw Mika’il standing close by with a satisfied smile on his face. “I have the ID boss, you were right, it wasn’t a robbery after all! He had his wallet and I know his name. It is Clyde Belgen.” Sara’s head suddenly started to spin and she felt like she could throw up. Clyde Belgen. She couldn’t believe it. She turned around to where the body was still lying and with a strong feeling of guilt she couldn’t shake she turned around back to her patrol car and drove straight to the station.